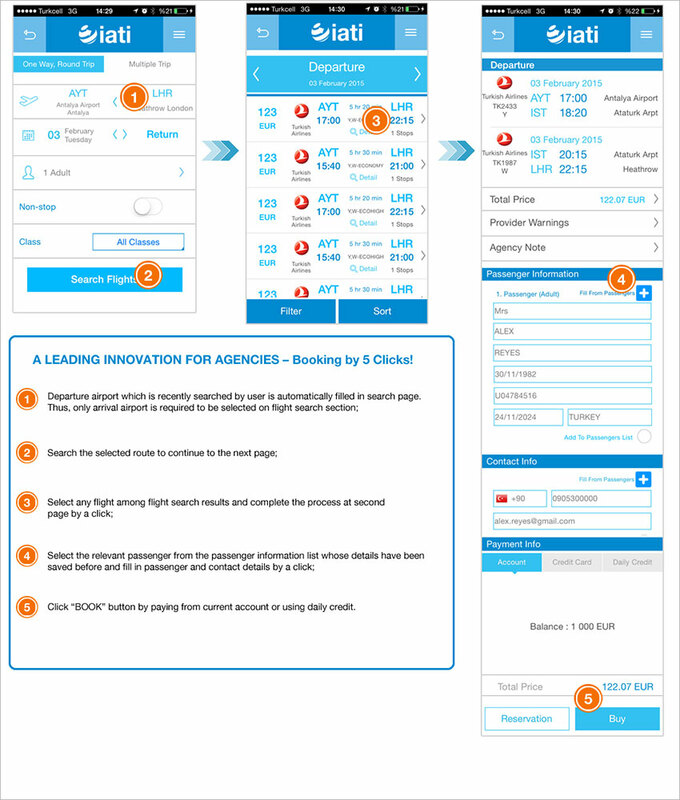 Booking ability while travelling or talking on the phone simultaneously You can continue talking with your client on mobile phone and select & book any flight by using IATI agent application at the same time. Filling passenger information on reservation page automatically and also adding any new passenger to the list instantly. You can upload name, surname, birth date, passport details and contact information of any passenger by a click. Sending any task request inside PNR at ticket operations You can realize any ticket operation with Call Center at Mobile application as well. Receiving a notification about the result of IATI Call Center transactions to mobile phone by "Push Notification" feature A notification is sent to mobile phone for Call Center’s reply to task request, airline due date change and reservation expiry etc. Book tickets at 3 steps , 5 clicks! Aby zarejestrowac się w IATI, proszę kliknij tutaj tutaj .